Gun Owners Win Key Elections Last Night! Last night was a great night for pro-gun candidates around Iowa! As we’ve been telling you for some time, Iowa Gun Owners ran a thorough candidate survey program to get all the candidates on the record for or against the 2nd Amendment. Based on the results of that survey, we set about educating gun owners in targeted races all over the state using a combination of mail, email, social media, radio ads and more! Last night, that paid off! In House District 4 (Sioux Co.) pro-gun candidate Skyler Wheeler was facing two anti-gun candidates in the primary election last night. Both of the anti-gun candidates refused to sign our simple 8 question survey and both of them spoke out AGAINST Stand-Your-Ground law! 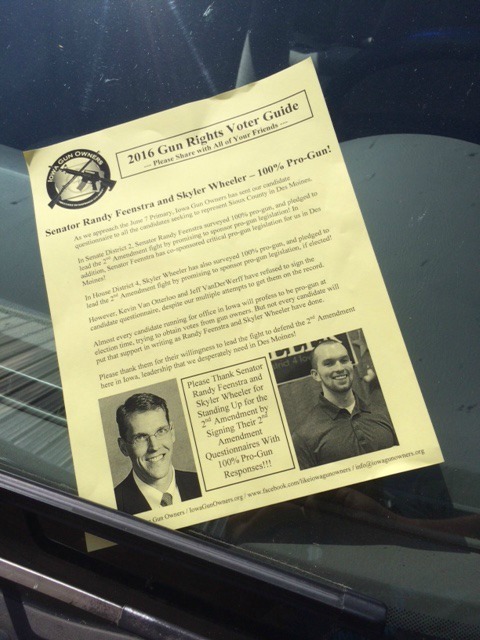 Iowa Gun Owners staff and volunteers spent days crisscrossing that district going house-to-house visiting with gun owners and making sure they knew where the candidates stood on the issue of their gun rights. Last night, Skyler Wheeler won with a massive margin, 15% above his nearest competitor! Based on the results of his candidate survey, we expect Skyler to be a solidly pro-gun vote in the Iowa House. Over in House District 77, pro-gun candidate Royce Phillips faced off against Paula Dreeszen for the GOP nomination. Royce was unashamedly pro-gun when completing our survey and pledged to not only vote pro-gun, but sponsor pro-gun legislation if elected! Despite our multiple attempts to get her on the record, Paula Dreeszen REFUSED to tell gun owners where she stands on the 2nd Amendment. Armed with this information, we used an aggressively social media campaign to educate gun owners in that district about the differences between the two candidates, so they could make an informed decision. Last night, gun owners spoke loudly as Royce Phillips was successful in his bid to be the GOP nominee with a stunning 72% to 28% victory! In Senate District 8, (Council Bluffs) where all three candidates in the primary surveyed 100% pro-gun, Dan Dawson prevailed last night – setting the stage for a major battle in that district in the Fall against the notoriously anti-gun Senate Majority Leader Mike Gronstal. You’ll be hearing much more about this race in the months ahead. There were multiple other pro-gun candidates who went on to victory last night, setting them up for a general election show down later on this year. Thank you, for the activism you took in contacting these candidates to urge them to get on the record as they sought your vote. The best time to get candidates on the record is during an election. Thank you also for giving us the financial resources we needed to run these crucial programs. We weren’t able to be effective in every race, no one bats 100% all the time, but virtually every candidate seeking office here in Iowa knows that they ignore or trample on the Second Amendment at their own peril! P.S. Last night was a good night for gun owners as pro-gun candidates won their primaries in the House and Senate all over Iowa! Iowa Gun Owners was actively involved in educating gun owners about where the candidates stood in many of these races, ensuring that anti-gun candidates couldn’t mask their views on your gun rights. Thank you for your support of these critical programs! Now it’s time to prepare to mobilize gun owners in the Fall!